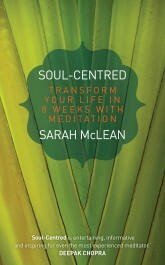 The book I've just finished reading is Soul-Centred: Transform Your Life in 8 Weeks with Meditation by meditation teacher Sarah McLean. I picked it up because it was my birthday - a time when I often think about the transformations I would like in my life for the year ahead. In particular, I could do with less stress - and meditation is supposed to be good for that. The blurb promoting this book also claims that meditation can help you to look and feel younger. It says: "Meditation is scientifically proven to slow down the aging process; according to researchers at the University of California-Davis, meditators show improved psychological wellbeing, and these improvements lead to biochemical changes associated with resistance to ageing at the cellular level." I'm normally a bit sceptical about promises of miracle youth cures, but I can see that being more relaxed could stave off the frown lines. In Soul-Centred: Transform Your Life in 8 Weeks with Meditation, Sarah explains simple techniques to learn to meditate. According to the blurb, these are based on the lessons she has taught to thousands of students over the past 20 years. They are set out in the form of an eight-week course, beginning with very simple breath awareness and body awareness exercises to do for 15 minutes every morning and evening. Week two offers meditations to reduce stress - just what I was looking for. Week three is about learning to live in the moment and avoid preconceived judgements, week four teaches that we need to have love for ourselves in order to be happy, while week five turns to the core concept of the book - how to be soul-centred. This is a shift in perspective that involves not looking to the outside world or to others for a sense of our worth, but instead listening to our own inner wisdom to guide us through life and to make the right choices. The next two chapters are about learning to communicate with honesty, recognising our heart's desires and allowing ourselves to try find what we want. The eighth chapter draws on the exercises of the earlier lessons to help us to create a personal meditation retreat in our own home. Although I've read the book - and tried out some of the early meditations - I haven't worked my way through the entire eight weeks yet. To be honest, I'm not sure if I will, but I do feel I've learnt more about what meditation is all about and the benefits it offers. I can see that if you want to learn meditation from a book, this would be a good one to buy. Soul-Centred: Transform Your Life in 8 Weeks with Meditation is published by Hay House.